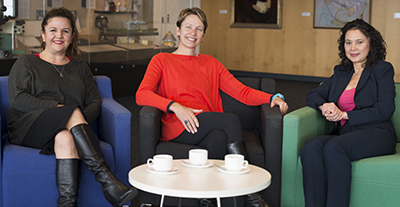 Dr Laskos (left) has worked with clinical researchers at the Walter and Eliza Hall Institute for more than six years to facilitate the translation of medical research into health outcomes and to develop supporting strategies and initiatives. She has extensive experience in the ethical considerations of human medical research. Dr Laskos has previously worked in the legal sector and has completed a PhD in infectious diseases. Ms Harris (centre) works with Dr Laskos at the Walter and Eliza Hall Institute to facilitate the progression of medical research. Prior to working at the institute, Ms Harris was a critical care nurse and educator for more than 10 years. This experience enables her to coordinate the clinical aspects of the institute’s Clinical Translation Centre. Ms Le (right) supports translational research at the Walter and Eliza Hall Institute, Melbourne Health and the University of Melbourne. Prior to this she worked in the public health sector for over 18 years supporting clinical services such as BreastScreen at Southern Health. Your suggestions on how the Volunteer Blood Donor Registry can be improved are most welcome!